PRESIDENT Edgar Lungu has described the freedom fighter Mama ChibesaKankasa as a selfless and industrious person who deserves to be emulated by the current generation of politicians. 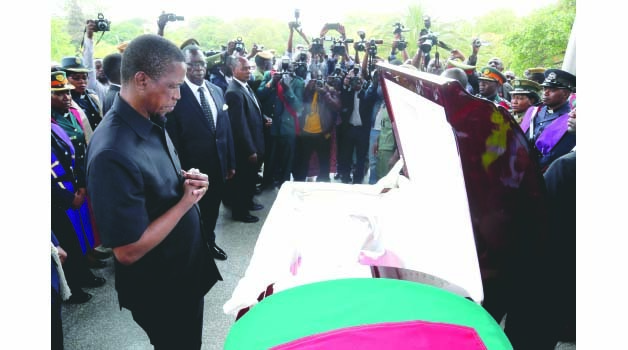 President Lungu told a packed Cathedral of the Holy Cross requiem service for the freedom fighter in Lusaka yesterday that current politicians would do well to imitate the life of Mama Kankasa who saw political office as an opportunity to serve. He said among the things to learn from the nationalists who sacrificed for the freedom struggle, was their selflessness and commitment to uplifting the cause for Zambia, and above all, their unflinching patriotism. The president said it was embarrassing to note the emergence of debasing conduct such as tribalism, regionalism and many other distractions that had crept into the present political space. “It is this fear of losing an entire legacy the freedom fighters left us that their demise doubles the pain we feel at their passing,” he said. President Lungu said with the death of the selfless Mama Kankasa, the nation had been afflicted doubly; losing a freedom fighter, but also the great values upon which her generation built the foundation of the republic. He said although it had been his hope that Mama Kankasa would recover – from the illness to which ultimately succumbed while receiving treatment in South Africa- and return to continue giving her cherished counsel and wisdom on various national issues, especially in politics, God had his own plans. President Lungu said Mama Kankasa’s long and active political life and one decorated by well-deserved accolades should be emulated by politicians of this era. “I have fond memories of my interactions with her at State House during Independence Day celebrations and many other occasions. Despite her advanced age, she made every effort to attend national events, this is a rare mark of commitment and patriotism, which our current generation of politicians must emulate”, he said. He said the death of Mama Kankasa was not only a major loss to her children, her family and her compatriots in the struggle for our country’s independence, but the entire nation at large. He said it was important to embrace the ‘One Zambia One Nation motto’, which Mama Kankasa actively participated and exhibited during her tour of duty as a politician. “We will do well to honour her legacy by co-existing as a nation and give her a befitting send off as a renowned freedom fighter, national leader, and distinguished servant of the people,” he said. Chipepo Kankasa said Mama Kankasa was a great mother and loved not only her children but everyone around her. “We considered our mother as an original emancipater, a hard working woman who natured 10 children along with a career,” she said. Dr Kankasa said her mother was a strong principled woman who was the true picture of a decent woman. “We were constantly groomed to grow in the right way and we were taught respect because she encouraged us to be brave,” she said. 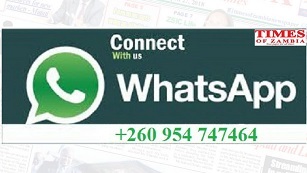 Zambia United National Freedom Fighters Association (ZUNFFA) Chairman Sikota Wina said the name ‘Kankasa’ had left a legacy that most women should emulate. He said as a freedom fighter she was brave and worked selflessly. First Deputy speaker of National Assembly Catherine Namugala said Mama Kankaka was a legendary woman who was principled and never gave up, virtues that all Zambian women should aspire to. In attendance at the service wereSpeaker of the National Assembly Patrick Matibini, Cabinet and provincial ministers, former ministers, senior Patriotic Front committee members, diplomats and opposition political party leaders.